Wat festival/fundraiser - head of the dragon boat that held the money trees. 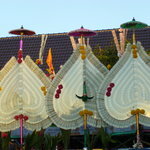 A Thai woman in festival dress. 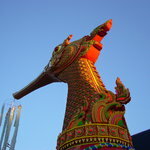 One of the many dragons that grace the entryways of Thai temples. 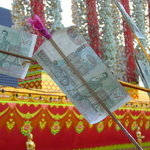 Wat festival - the main purpose is to fund raise for the completion of the wat, so there were all sorts of money decorations. This is a close-up of a money tree, of which there were many in the dragon boat. 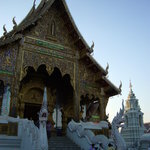 Wat festival - the main chapel-like thing that contains the statue of the Buddha. 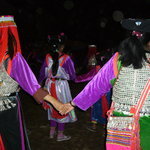 Lisu, hill tribe, festival dance. 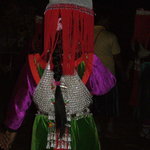 Close-up of a Lisu woman's hair. 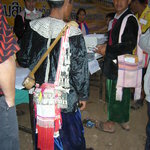 One of the musicians for the Lisu festival. 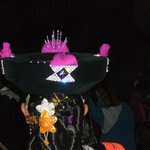 A Lisu woman in her finery. A shop window in Pai. We went to visit a nearby village. Faa, the wife of our handyman, Mook, came from this village and still has family here. This, however, is a pig. The reason for our visit was this biodigester that is turning pig manure into gas for cooking. Chickens. These chickens are housed above a catfish pond so that they can help nourish the fish. The water is also used to water crops. Mook showing off the stove fueled by the biodigester. 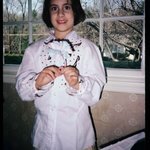 You can't actually see it in this photo. In the foreground is the original wood-powered kitchen.